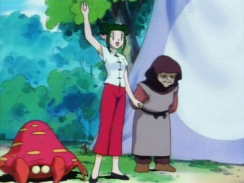 Japanese Episode 44: "Paras and Parasect"
American Episode 42: "The Problem with Paras"
Satoshi and his friends arrive in Matsumo Town, a small village that invites our heroes to stock up on potions and other medicinal items. As our heroes look for the local pharmacy, the Rocket-Dan's Nyarth collapses from a fever! 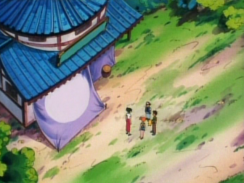 Musashi and Kojirou are about to leave the pokemon behind when Kiyomi, a local medicine woman, happens to walk by and fixes up a medicine that brings down Nyarth's fever. 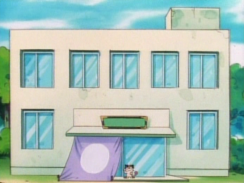 Once the cat pokemon is better, Kiyomi returns to the medicine shop where Satoshi and the others are waiting. 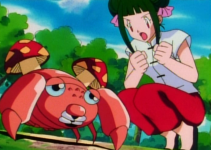 As they talk, Kiyomi explains that she dreams of making a miracle potion that is able to cure any illness but that in order to do so she'll need her Paras to evolve into Parasect. The problem, however, is that Paras is such a weakling that she's afraid it'll never gain enough experience to evolve! Satoshi decides to help out by having his pokemon throw battle after battle, hoping that a “winning streak” will boost Paras' confidence. Unfortunately, Satoshi's Lizardo doesn't go along with this plan and actually manages to scare Kiyomi's pokemon off instead! Later, the Rocket trio finds the frightened Paras and decides to help it out for their own selfish reasons. 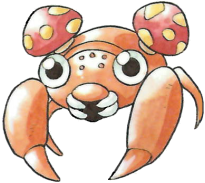 Thanks to Matadogasu's and Arbok's uncanny ability to consistently lose, Paras finally gains enough experience to evolve into Parasect! Kiyomi's pokemon is now even strong enough to single-handedly take out Satoshi's Lizardo! 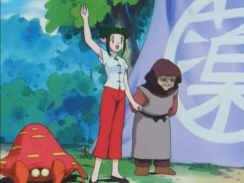 Now that Kiyomi's problem has been solved, our heroes leave Matsumo Town for their next adventure. The general idea of the Pocket Monsters TV series is to sell you a bunch of crap, and one of the best way to do that is to devote entire episodes on one of the show's titular creatures. I like to imagine the staff of the TV series look at the character artwork, the moves it can learn, its Pokemon Bestiary entry, and any in-game story events and use those as a jumping point for story ideas. You look at a pokemon like Metamon, see that its gimmick is being able to transform into any pokemon, and make a story around that. A pokemon like Porygon is said to be made up entirely of computer code, so you make an episode where our heroes enter a computer. But then...you get something like Paras. Japanese Red & Green: The mushroom that grows on this bug's back is called caterpillar fungus. As this pokemon grows up its mushrooms become bigger. Not much here either, is there? The TV staff eventually went with a Chinese medicine woman wanting to use the pokemon's mushrooms to make a miracle potion, which is probably the best story we could have hoped for given what little they had to work with back then. 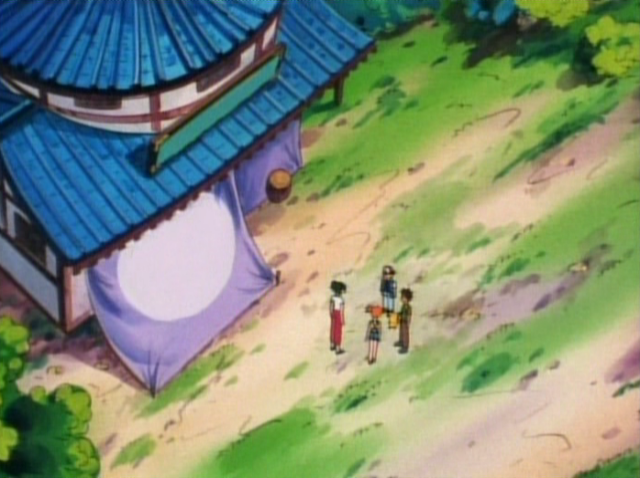 Whenever I watch this episode I can't help but think "Aw, they tried their best..." and though this isn't my favorite Kanto episode by a long shot I do appreciate it for what it is. Another thing I remember this episode for is the weird crush the cat pokemon Nyarth has on the human woman Kiyomi. This was years and years before the Diamond & Pearl games dropped that bombshell about humans marrying pokemon, by the way! The whole thing's pretty icky but at the same time it's not like she reciprocates his feelings or anything so at least we were never any danger of this turning into a 2006 Sonic The Hedgehog situation. Still, though. This is also the first we're getting to see of the whole "Lizardo / Lizardon doesn't obey Satoshi" storyline that'll be a big part of the TV series for the next year or so. It's one of the first "big" storylines this franchise tries to do and, like most first attempts, there are quite a bit of hiccups along the way. The abrupt beginning to the plot coupled with the fact that absolutely no progress is made until late Orange Islands is an issue but hey, at least they're trying something new, right? I wonder if the idea this episode's writer, Atsuhiro Tomioka, of this episode had was that Satoshi's Lizardo is starting to look down on its Trainer because one of the first things it's asked to do after evolving is throw a match to such a weak pokemon but I have a feeling that might just be me overthinking things. 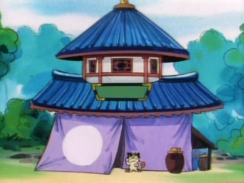 The first 40 episodes of the English dub debuted in syndication in the U.S., which meant that the network it aired on varied depending on where you lived. For some people, Pokémon aired on their local Fox station while for others, it was UPN or ABC. For me, Pokémon aired on my local WB! affiliate at 6:30am, Monday through Friday. But as of this episode, Pokémon officially moved to Kids' WB! and secured itself a stable network for years to come. Not a lot of shows made the jump from syndication to a real, actual network and so the fact that Pokémon was able to do so in such a short amount of time is actually quite remarkable. Less remarkable is the dub, which more or less continues doing the same it did for the first 40 episodes, for better or for worse. 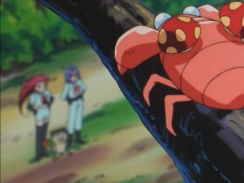 Both Paras and Parasect keep their Japanese voices. Misty: "Might as well grab a bite to eat, too." Ash: "I'm dyin' for a cheeseburger." Misty: "No way! I wanna eat at a nice restaurant!" Originally, Satoshi wants to eat hamburger curry while Kasumi prefers to eat katsudon. 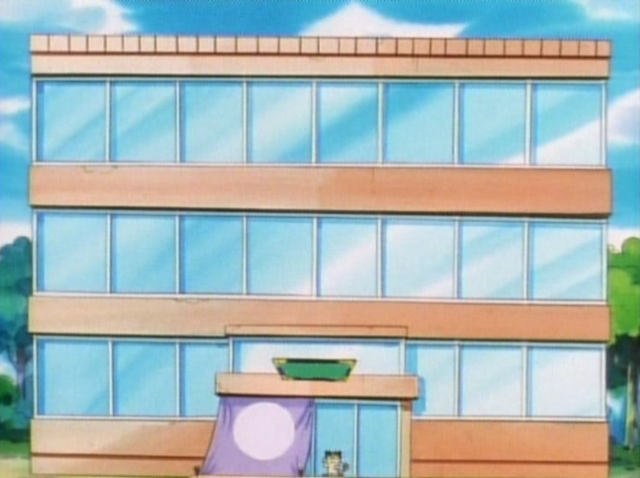 James: "If we leave Meowth here, he could collapse from that fever." Jessie: "Don't worry. He's till got eight more lives left." James: "That's a good point." 4Kids' version is actually a pretty decent equivalent of the Japanese version, believe it or not. In the original, Musashi tells Kojirou not to worry because Nyarth is a bakeneko (化け猫), a term that literally means "monster cat" but is more often used to describe how cats are stubborn and refuse to die. You know, falling from tall distances but always landing on their feet, being dexterous and capable of avoiding danger that would kill other animals, etc. In English we have the phrase "a cat has nine lives" to express the same sentiment; cats are so stubborn when it comes to death that it's as if they live nine lives. Jessie's quote here in the English version plays with that idea. Kojirou: "We were on our way to take care of some urgent business anyway." James: "Don't you recognize superheroes when you see them?" Musashi: "We are travelers on a mission." Jessie: "Sometimes we both go undercover..."
Kojirou: "And when there's trouble on the road...we can't stop..."
James: "But our enemies soon discover..."
Musashi and Kojirou: "...for every little thing!" 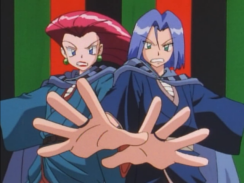 Jessie and James: "We're the Team Rocket Super Squad!" Kiyomi: "How can you look at what's going on and say this is any little thing!?" Cassandra: "You're super losers if you'd leave a sick Pokémon!" James: "I guess you're right." The dialogue could have been kept as-is without any issues whatsoever but I guess 4Kids felt like they couldn't let this scene go without at least trying to explain why the duo's dressed the way they are. And it's not like American kids are going to recognize those outfits as traditional clothing worn by travelers during Japan's feudal eras, y'know? Still, I think just letting the visuals go without any attempt at an explanation would have been fine. "We're on a journey so we're busy" is the reason they want to leave their cat pokemon behind in both versions, right? Shoehorning some superhero nonsense in all that isn't necessary. The kanji for kusuri ("medicine") is painted away from the front of the shop, as are the words Kampo-dou (カンポ― 堂), or "Traditional Chinese Medicine Shop ". This edit occurs about nine times in this episode. Because of this, it kind of looks like Cassandra's shop permanently has a spotlight shining on it, doesn't it? 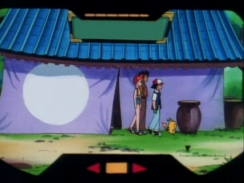 Misty: "We'd like to buy some potions and antidotes." Lacy: "Heh heh heh heh...got some snakeroot that'll cure insomnia and grow hair on your nose and tongue." Misty: "Grow hair on your nose and tongue!?" Brock: "Uh, does it come in a "no hair" formula?" Originally the old woman asks our heroes if they'd like to try some of her shop's special Koiking whiskers. Kasumi repeats "Koiking whiskers!?" while Takeshi asks if they have any "normal" medicine. The point of the scene ("ancient Chinese medicine is weird and gross") is the same in both versions so why change Koiking whiskers to snakeroot? The outside of the shop gets edited again. 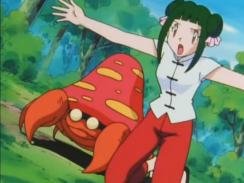 Pokédex: "Paras, the mushroom Pokémon. Rare mushrooms grow on its back." The Japanese Pokemon Bestiary gives more detail, telling us that the name of the mushrooms on its back are called caterpillar fungus. Brock: "The best way for Pokémon to evolve is by winning battles. The more battles they win, the quicker they evolve." 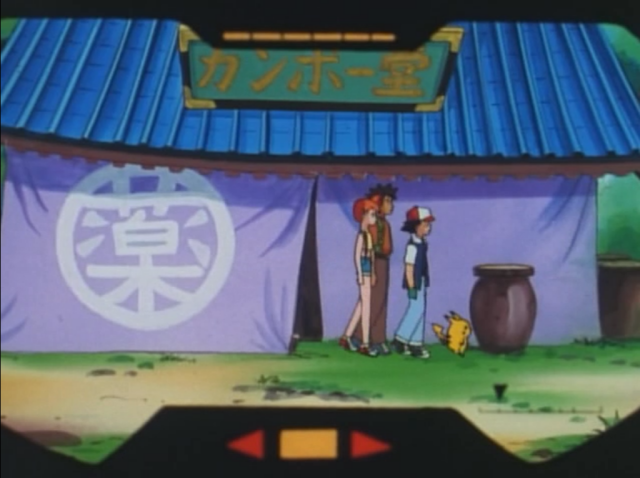 In the Japanese version Takeshi adds that when pokemon battle, they gain experience points. This little bit of in-game terminology's not present in the dub. Kojirou: "Don't be shy. I know exactly how you feel." James: "Don't be shy. I know exactly how you feel about her." Nyarth: "You understand what I'm going through...?" Meowth: "You don't think I'm an idiot!?" Kojirou: "After all, she took care of you just like Nightengale!" James: "You might say that Cassandra's one female who knows how to treat a feline." Nyarth: "I can still feel her touch on my paws nya~"
Meowth: "I was so unprepared for love." James: "Well, Cupid's arrow strikes...when you least expect it!" The Japanese version's Florence Nightengale reference gets replaced with a Cupid reference. 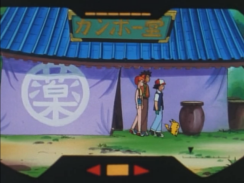 Ash: "Pikachu, Electric...uh, I mean..."
Misty: "What's the matter, Ash?" 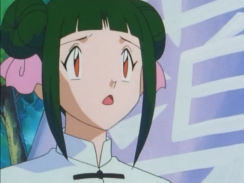 Ash: "Electric Shock might be overdoing it." Misty: "Yeah, you might be right." "Electric Shock" is the translated version of the Japanese attack Denki Shokku (でんきショック) which is usually rendered as "Thundershock" in the English localizations. Whoops! Later, Satoshi starts to order his Pikachu to use 10,000 Volts, the attack known as "Thunderbolt" in the English localizations, but quickly changes the command to the non-existent "10 Volt attack" to avoid overpowering Paras. The dub handles this "playing around with attack names" by having Ash order Pikachu to let out a "teenie static bolt" instead. The kusuri text gets painted away again while Kiyomi talks about her miracle potion. I mean look at that! Nearly half the screen is covered in digital paint! 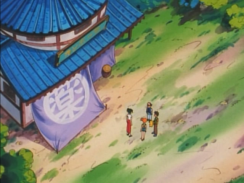 Musashi: "What reason do we have to help train that puny little Paras?" Jessie: "And if James and I help this worthless little Paras, what's in it for us?" James: "What do we get?" Nyarth: "You idiots nya. If we make it evolve then that woman - and, by extension, her shop - will owe us big time." Meowth: "I'll tell you what ya get. If you two make this Paras evolve, then you can become rich beyond your wildest dreams!" Nyarth: "And you humans have a foolish tendency to listen to whatever their benefactors say." 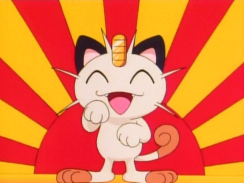 Meowth: "Cassandra's Miracle Pokémon Potion could make millions. Maybe even zillions!" Musashi and Kojirou: "Um-hmm, um-hmm." Jessie and James: "Um-hmm, um-hmm." Musashi: "And then...? What will the shop do for these benefactors?" Jessie: "And how do we get rich from her potion?" 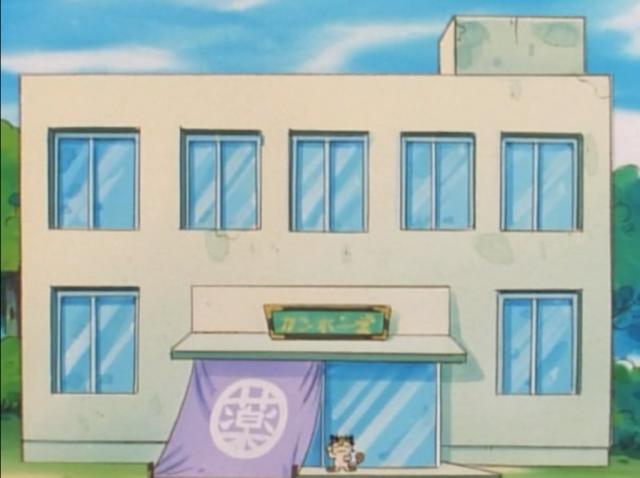 Nyarth: "Nyaa will become that shop's beckoning cat and help its business prosper!" 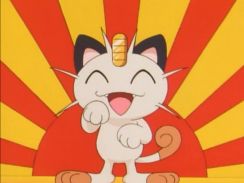 Meowth: "Once me and her are a cozy twosome she'll make me her company mascot!" Musashi: "Thanks for your hard work." Jessie: "We're thrilled for you." Kojirou: "Yeah, good luck with that." James: "But we won't get rich." Nyarth: "Nyaa's motto is that now's always a good time to give gold coins to a cat. This is a great chance to make a lot of money. Will you two get in on this nyaa?" 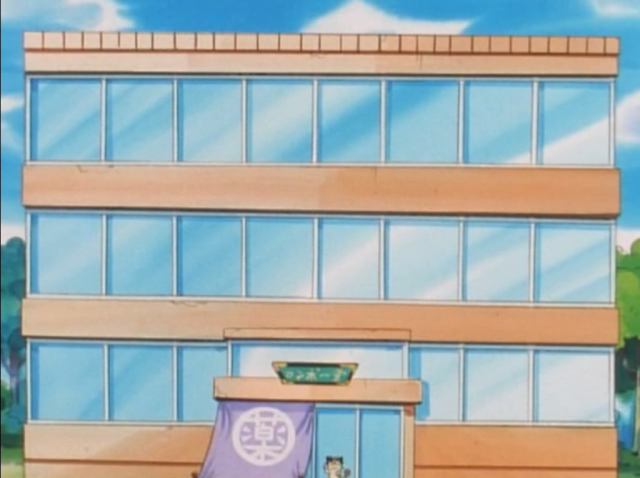 Meowth: "I was plannin' on makin you two my business managers. I'll have a lot of money to manage. But if you'd rather not, I'll understand." 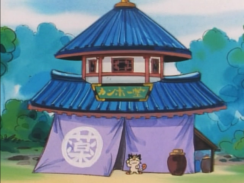 On top of all this, Nyarth becomes a real maneki neko (招き猫), or "beckoning cat," during the reveal of his big plan. 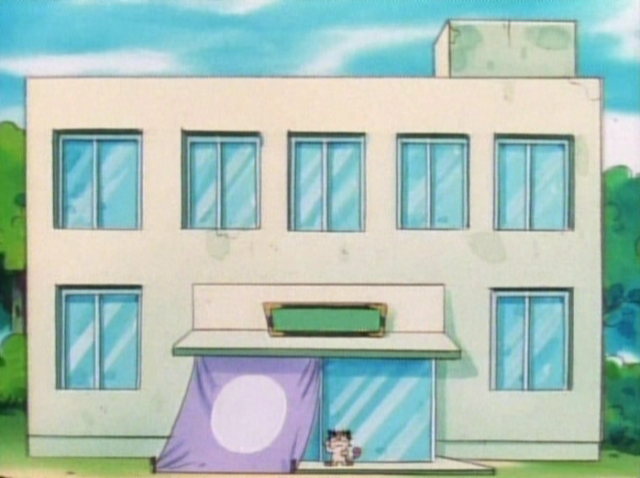 The English dub removes this one-second shot and extends the footage that came before that to make up for it. 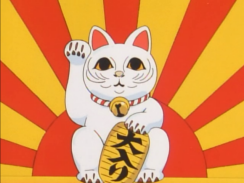 I understand changing the Japanese-only maneki neko into a more Western-friendly "company mascot" but I don't really get why 4Kids would rewrite the part of the plan where Kiyomi does all this as a way to pay them back out of gratitude. Maybe there was a mouth flap issue? Meowth: "Cuz losing battles is their specialty." Jessie: "He's got a point." James: "They're bigger losers than the guy who invented homework!" Guess which line got rewritten here! Originally, Kojirou says that "losing" is their number one special attack. Jessie: "A few lousy wins and it thinks it's Tarzan." 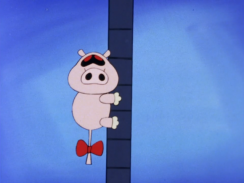 Originally, Musashi says "Even a Paras can climb a tree if it's flattered enough" (パラスもおだてりゃ木に登るか～？), which is a variation of a saying commonly used gag in the Time Bokan series "Even a pig can climb a tree if it's flattered enough" (豚もおだてりゃ木に登る). Originally, Kiyomi's talking to Lizardo, not Parasect. But I think the animation that goes along with this line makes that pretty clear, wouldn't you say? 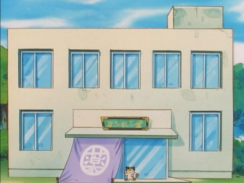 The front of Kiyomi's shop gets erased a few more times before the end of the episode. 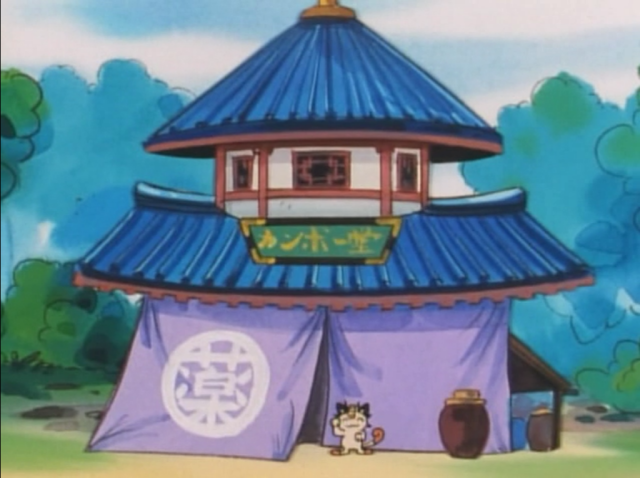 Nyarth: "And, y'know, if it's OK with you, nyaa can work as this shop's beckoning cat and can help bring in a lot of busi-"
Meowth: "Now that fate's thrown us together to help the Pokémon of the world, I guess it's only natural to make me a company mascot." Kiyomi: "You three are in the middle of a journey, aren't you? You have an important goal, right?" Cassandra: "I'd never tear you away from Team Rocket! You're a superhero team, aren't you?" Jessie: "Well, we are super." Kiyomi: "Helping out Paras the way you did was thanks enough." Cassandra: "It was superheroic to help out with Paras like that." Lacy: "We've already got a company mascot anyway!" Lacy: "I found this Persian snoozing in the backyard." The old woman's line in the original is that she got (ゲット) the Persian she's dragging into the shop, like with a Monster Ball and everything. The English dub is a little more ambiguous.